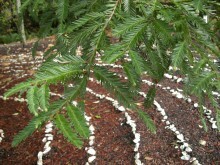 Looking down, my feet slowly pace the labyrinth at Harmony Hill, Union, Washington. Made by oyster shells successively placed ten inches or so apart, the path spirals under a towering coastal hemlock, Tsuga heterophylla, with narrow feathery glistening green needles. 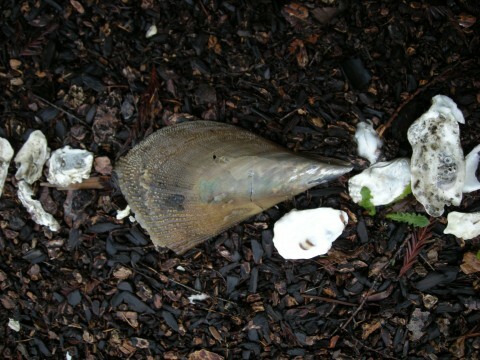 In the grey autumnal morning I notice someone has placed along the way halves of a giant brown bivalve resembling a granddaddy mussel. Intrigued, I study their triangular shape, pointy joins, dull bronze exterior with flattened spines like tiny upended slats along the wider ends, their pearly blue-brown nacre interior. At the center several intact mated shells lean upright against the massive brown bark trunk. Few, they stand out! Where did they come from? Their thinness and fine spines toward the outer third suggest warmer waters, but Atlantic or Pacific? Who dared add these outsider shells like syncopation to the chunky blue-white natives? Looking out, mist clouds the view to Hood Canal, Olympic mountains, world beyond. Looking up, strong branches radiate thickly from the great trunk and obscure the sky. Amidst foggy light, grey salt air, pliant chocolate humus underfoot, raindrops ping on nearby foliage. Acer macrophyllum, big-leaf maple leaves have drifted face down, their strong ribs and stems on top. What life do they shield like tents underneath, like buffalos decaying into the prairie, or whale carcasses on the sea floor? This place in nature embodies the Chinese character 王, wang′ for king. Like the ruler, the central tree mediates among earth, society, and heaven. 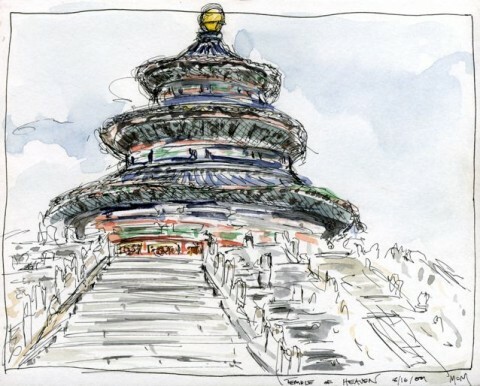 Mapping the same character, the Ming Dynasty architects of the Beijing Temple complex aligned along a single axis the Altar to Earth, Hall of the Ancestors, and triple-domed Temple of Heaven. 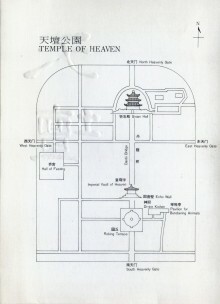 To retain the Mandate of Heaven or the right to rule, expressed in freedom from disasters and harmony in the realm, the emperor worshipped in rituals set seasonally and consecutively from the bridal-cake Altar to Earth, through the single-domed Hall of the Ancestors enclosed in a circular “echo” wall, and finally, into the monumental three-tiered Temple of Heaven. Outside, the sentinel hemlock recalls the four giant pillars inside the Temple of Heaven. Restored in the 1920s, such ancient evergreens of great girth from coastal Oregon replaced the semi-millennial originals. Today, east and west of the Pacific Ocean, living and built trunks hold up the dome of the sky. 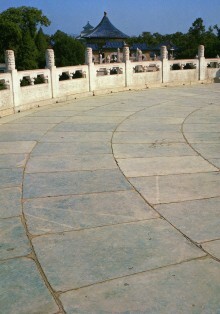 Looking in, the creators of the labyrinth at Chartres Cathedral in France provided a peaceful diversion from crusading. Monks laid the path in stone in the floor toward the back of the nave. Early pilgrims traced the same path, progressing on their knees. 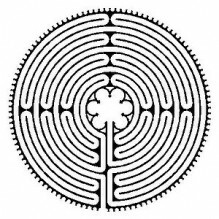 Here, outside, I wish the narrow paths were wider, the diameter of the labyrinth and its walk, ever larger to embrace the whole earth, humankind, nature, the massive tree stretching to the sky—pointing into deep space: the Great I AM. Looking after. Faith and poet Rainer Maria Rilke teach to question and be patient for answers. My inquiry about the unusual shells brought the information that a visitor involved in the care of cancer patients had placed them. The edible Atrina rigida or Stiff Pen Shell, also called Pearl Oyster, is native to the Gulf of Mexico and abundant along the West Coast of Florida. 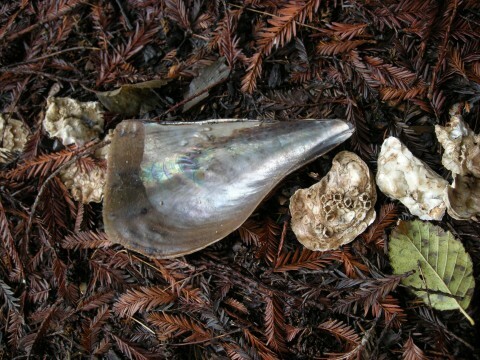 Its reddish bronze color, elongated asymmetrical triangular shape and irregular rows of more delicate spines toward the end contrast to the grey-white and bluish tones, chunkier bumps and ripples of the stocky Hood Canal mollusks. Both species live in salt waters over which the sun sets. The metaphor of cancer dances on the edge of my imagination. Like these odd Floridian Stiff Pen Shells, cancer cells turn up beyond normal boundaries. Living, some grow and travel more aggressively than others, none know when to stop. Cells go rogue. What accounts for the increasing incidence of cancers? How have we heedlessly and arrogantly introduced new chemicals, upset natural equilibria, waged war within and among ourselves? What therapies can we devise? Love made the labyrinth and the welcoming havens. The labyrinth is not a maze. In treading our journey, we can lose our way, but are never lost. S-N: Altar to Earth, Hall of Ancestors, Temple of Heaven, Beijing, Peoples Republic of China, Reign of Yong Le Emperor, Ming Dynasty, 1420 C.E. “To you I lift up my eyes, to you enthroned in the heavens.” -Psalm 123. 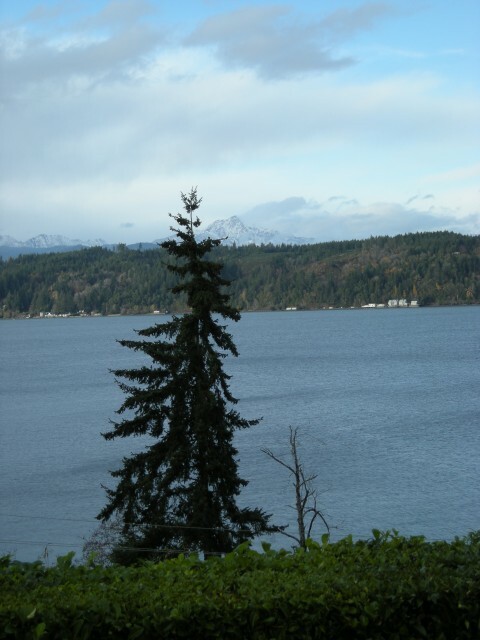 Looking North across Hood Canal, The Brothers Peaks, Olympic Mountains, in fleeting November afternoon sunshine. Heartfelt thanks to St. Andrew’s House and Harmony Hill, neighbor retreat and conference centers in Union, Washington.